Without the idea for a product or service, business model generation and customer discovery can not begin. It is this first step of defining the idea that The Opportunity Analysis Canvas aims to fulfill. By studying The Opportunity Analysis Canvas, your awareness of entrepreneurial mindset, motivation, and behavior can expand. You can appreciate the roles of markets and industries in entrepreneurial opportunities, and understand value innovation and the fundamentals of opportunity identification as key elements of entrepreneurial action. Once a product or service idea is generated via The Opportunity Analysis Canvas, or independently, The Startup Analysis Canvas enables aspiring entrepreneurs to transform the idea into a startup company. 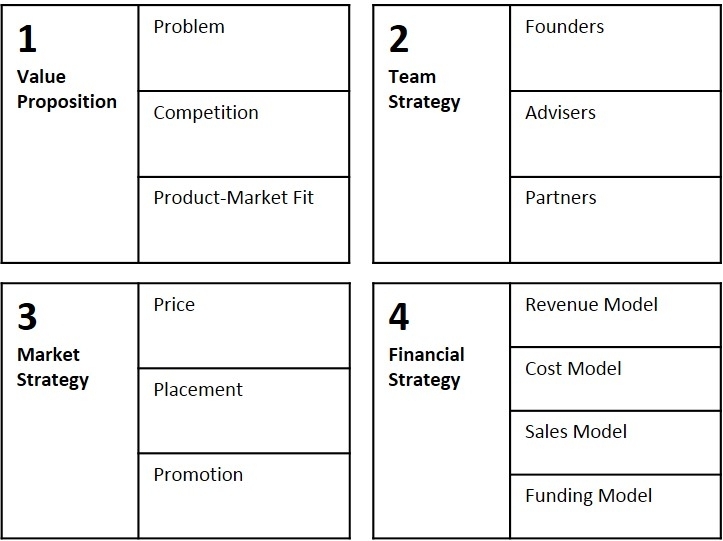 The Startup Analysis Canvas focuses on (1) understanding the theory and practice of value creation, (2) how to build the right team for your startup company, (3) avoiding wasting time with startup ideas with limited commercial potential, and (4) raising the right financial capital at the right time for the right purpose. Inspired by an interest in creating a streamlined version of The Business Model Canvas that is specialized for first-time student entrepreneurs, The Startup Analysis Canvas emphasizes the aforementioned four areas where aspiring entrepreneurs often struggle. For educators, these two canvases may be taught in two separate courses, or combined into a single course comprised of both canvases.